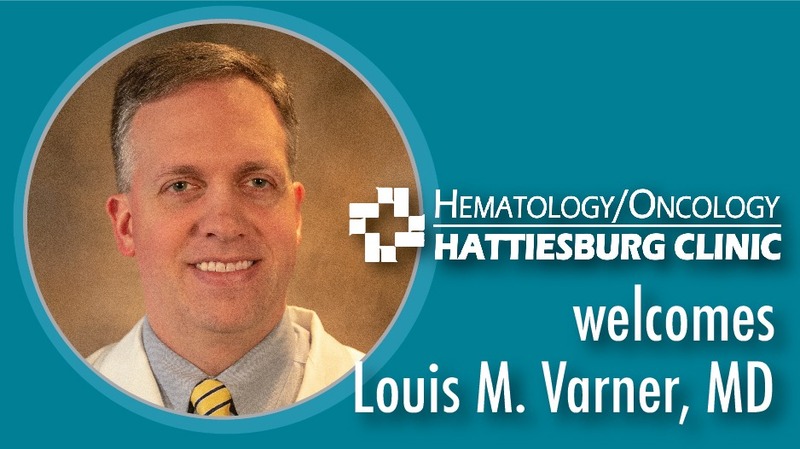 Louis M. Varner, MD, recently joined Hattiesburg Clinic Hematology/Oncology. At Hattiesburg Clinic Hematology/Oncology, Varner specializes in the diagnosis and management of cancers and blood disorders. Varner received his medical degree from the University of Mississippi School of Medicine in Jackson, Miss. He completed an internship and residency in internal medicine with the United States Air Force at San Antonio Uniformed Services Health Education Consortium in San Antonio, Texas. He also completed a fellowship in hematology and medical oncology at that same location. Varner is board certified in hematology and medical oncology by the American Board of Internal Medicine. He is a lieutenant colonel in the Mississippi Air National Guard, where he serves as a flight surgeon. Varner is also a member of the American College of Physicians. His special practice interests include molecular profiling of cancer for optimal treatment strategies and genetic risk assessment for heritable cancer syndromes. Varner said his goal is to provide up-to-date cancer treatment while forming strong, collaborative patient-physician relationships. Additional providers at Hematology/Oncology include Laurie E. Douglas, MD; J. Michael Herrington, MD; John S. “Bo” Hrom, MD, FACP; David G. Morris, MD; Bradley M. Myers, CNP; and Julie J. Simmons, CNP.